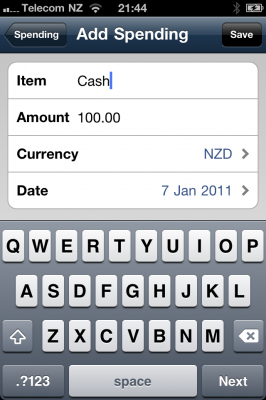 Trip Wallet, our latest iPhone app, is out! So, Trip Wallet is out. What is it? 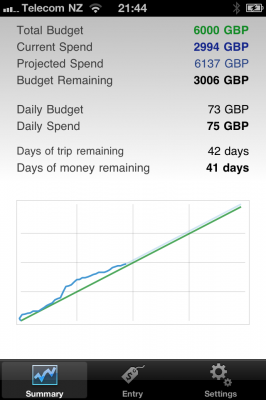 It's a small app for recording how much you are spending when you are on holiday (or any time, really - it's not at all limited to holiday spending). 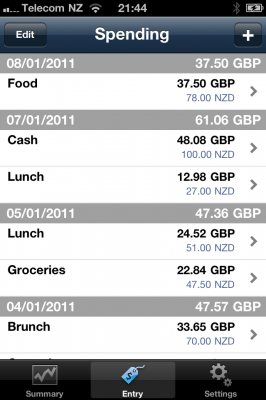 It allows you to enter in your holiday currency, but see how much you have spent in your home currency. As we are on "holiday" at the moment, we had a need for this, and the apps already in the AppStore were either fairly basic, or crashed a LOT. I've spent a bit of time and effort making the app work as smoothly as possible for the major use cases - it's focused the things you want to do often: entering a new spending item, and while all the other functions are there (the summary and setup info) this is secondary to loading the app, entering something you have just paid for, and saving it. Josh: It was important that we make it as stupid-simple as possible to pull out your phone, launch the app, and check in where you are. That’s the core experience we had to optimize—to make it as fast as possible. It has to be ex- traordinarily simple to choose your location and then actually check in. I’m a big fan of the “bFb” [big F—kin‘ button] and I think you always want to make it almost painfully obvious what people are supposed to do next. so on the de- tail view for a check-in spot, we’ve got a big orange check-in button. you can’t miss it. Get in, do what you need to do quickly, and get on with your day. I'm rather happy with the results, and it's been invaluable to us so far, in working out if we are going over what we intended to spend or not. Give it a try - I hope it's useful to you, too!